For him, his work, his passion, which found such intensity in struggle, was not a question of good vs. evil but a series of battles within the site of the ‘good’ itself. Whether you worship, revere, respect, fault or even detest him, the Mahatma, Gandhi, or as his British Indian Passport saw him, Mohandas Karamchand Gandhi, remains a character of great, if intriguing, relevance. Among his numerous contributions, one of the greatest is his redefining of the idea of struggle, of revolt and the role in these of violence. Each of these concepts has traditionally invoked hurt, suffering, and even death, very often to the oppressor himself. 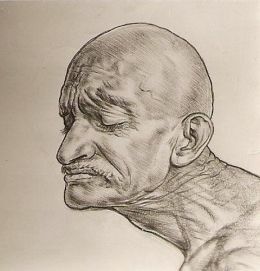 In Gandhi, the hurt and the suffering were self-inflicted. In fact, the more the hurt and suffering, the higher the risk of death, the ‘purer’ for him was the struggle, the more justified the revolt. For Gandhi, his work, his passion, which found such intensity in struggle, was not a question of good vs. evil but a series of battles within the site of the ‘good’ itself. Each mass movement gave a paradigm of change, which was about more than just the immediate objective. Both by intent and method, he left behind an altered scene in which both oppressed and oppressor stood challenged, transformed. Every January 30, at 5.17 pm, we revisit the moment of his ‘silencing’ with silence. At that moment not only was he killed but a wholly new vision that he had created evaporated. The sense of loss that engulfed the nation was about more than the loss of a person. A whole world crumbled at that instant, something only he represented, something only he was. Gandhi was saint, social reformer and freedom fighter, but what intrigues me is why he was different, not just in degree but in his whole being, from the many others who struggled for exactly the same causes. Like many before him he too traversed the country. But Gandhi did not travel to observe or learn from India in the ordinary sense. He became the laughter, tears, drudgery, suffering, friendship, anger and hope. The observer became the observed. Every experience moved him closer to who he was, leading to revelations that were not always pleasant, but were the truth. What he saw as the future was very different. The difference lay in his imagination, in his visualising sensibility. Yet what he saw as India’s destiny was anything but imaginary, it was tangible. It was not just about social inequalities and the depressing conditions, but he saw deep inside these external actualities, the hidden fire of tomorrow, the fire that would burn not to destroy but to recreate. This was the imagination of a master visionary, not a delusion of Mohandas. He knew that he had to address Today for a Tomorrow. But he also immediately realised that no one can address reality without imagining the future. To imagine something for oneself is one thing, but to make every other person imagine it at the same time is completely another. What of his own did Gandhi create in the actuality of Indians’ lives? The most magnificent ‘creation’ was the possibility of a future in which violence, bloodshed, hurt, and destruction were not part of the edifice. It was not a passive vision, rather an active, dynamic, even aggressive force that sought to change the weaknesses of a violent today for a morally mature tomorrow. He made an entire people envision something radically new. They were imagining a future without blood on their hands. This was the creation of the Mahatma. Was the identification of India with Gandhi’s vision of India self-deceptive, or, worse, was it false, a dream? As much as Gandhi may have tried to transfer his imagination to the people, it was essential that they feel his imagination, his vision within themselves as their own imagination and their own impulse and feeling. It was essential that they make Gandhi’s vision of the future, their India of the future, for which they took responsibility. They did try to do this, earnestly, emotionally, intellectually, with utmost loyalty. They felt the empowerment, happiness, joy and a possible future in equality in independent India. This was the master at work. This emotional world was charged using created action. The actions were not just about their political or social impact but about creating an emotional anchor. This was not the Mahatma’s personal anchor; it was the collective foundation for all. But this left everyone believing that Gandhi’s vision was their own. This connection existed only till the creator of the vision lived. His imagination of a future India was like a painting, which he made with his own life. The painting was his life and his life was the painting. Until he remained, the future as he envisioned was within everyone’s embrace. But with him gone, the illusion disappeared; what seemed to be their future, created by him, but collectively owned, existed no more. The memory of it lingers, of course, but it evokes nostalgia rather than the active, living participation he wanted. So, was his imagination a waste of his energy, of India’s time? The problem lies in the fact that everyone else is living in the imagination of these ‘thought leaders’ and not imagining for themselves. Every individual must imagine and work for true change in society. We took shelter within Gandhi’s imagination, forgetting that his greatest gift was the idea of imagination itself, which he did not own. Gandhi’s use of creative imagination is fascinating. He created from his experience and skills a certain vision which, like a piece of art, arose from within him, and then tried to envelop every individual around him. He also gave his personal vision a collective personality, by investing it with an objective quality, like an artist would his work of art. But is every one of us an artist? An artist lives within everyone, but we need to have the sensitivity to ‘receive the world’, the strength to question it, and emotions beyond the self to make of our experience what Gandhi did, namely, to present a new imagination that goes beyond the person who is imagining it. For a beautiful world, we all need to be artists in life and not live within the creations of others.